Sleepwalking and night terrors are not uncommon events in developing children. Though they can be quite frightening and worrisome for parents, there is little danger to the child. Both conditions are known as parasomnias, or events that occur during sleep. Knowing what do during your child's episode will put you at ease while reducing the amount of danger to your loved one. Sleepwalking occurs most commonly in children 11-12 years old. The disorder is relatively common: a 2007 Canadian study estimated that 14% of children aged 3-13 years have had at least one episode. Similarly, night terrors occur between ages 2-10 years old, though it is estimated that 39.8% of children aged 2.5-6 years old have had at least one episode. A sleepwalking episode typically lasts 30 seconds to 30 minutes, and is characterized by clumsy and purposeless movements while the eyes remain open. Occasionally, additional parasomnias will occur such as enuresis, bruxism (grinding of teeth) and body rocking. The child will never remembers the event in the morning. Night terrors are commonly misdiagnosed as nightmares, though there are distinct differences between the two. While nightmares occur in the second half of the night and can be remembered the next morning, night terrors occur about 15-90 minutes after falling asleep, cannot be recalled the next morning, are combined with sleepwalking in a third of cases, and involve autonomic nervous system activation such as high heart rate (tachycardia), profuse sweating (diaphoresis) and fast breathing (tachypnea). Additionally, reports of 390 pairs of twins suggest that night terrors may be genetic in origin. If you're concerned about your child's sleep walking or night terrors, it may help to know that most cases do not have an underlying disorder. Medications such as lithium, valproate and zolpidem have been associated with sleepwalking, but most cases are likely caused by stress or sleep deprivation. 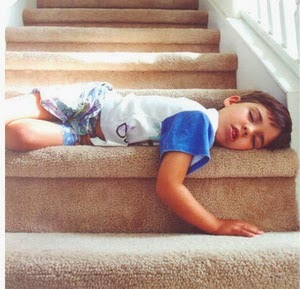 A major danger to children suffering from a sleepwalking episode lies in their surroundings- if you're witnessing the event or noticing recurring events, be sure to minimize any potential hazards by reducing any access to stairs or sharp objects. If your child is having multiple episodes of sleepwalking, be sure to mention it to your pediatrician. An important cause to rule out is seizure disorder with post-ictal activity. There are significant differences between seizure and sleepwalking, however, in cases of seizure the patient is unable to find his or her way back to their bed. Other medical illnesses, such as overactive thyroid, migraine, anxiety and Tourette syndrome may be to blame. Night Terrors. Dynamed Database. Updated May 13, 2014. Accessed June 23, 2014. Sleepwalking. Dynamed Database. Updated May 13, 2014. Accessed June 23, 2014.